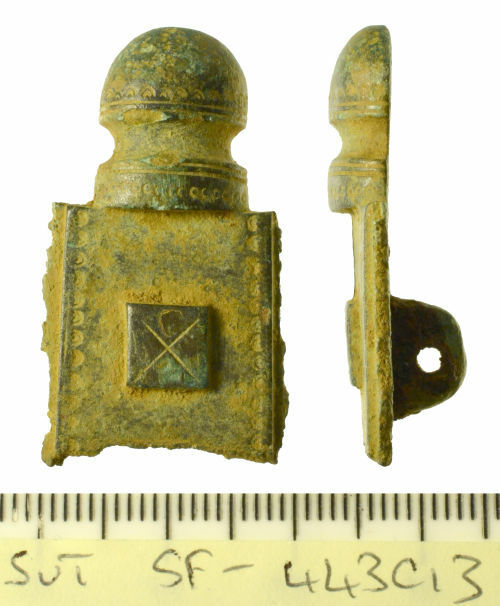 An incomplete cast copper-alloy cruciform brooch of Early-Medieval/Anglo-Saxon date. Only part of the headplate and top knob survive intact, the remainder of the object now missing due to old breaks. The central panel of the headplate is flat and rectangular in form. It is decorated along both sides with a vertical band of punched concentric semi-circles, with a raised square panel at the centre decorated with an incised cross saltire. Both sides of the headplate are now missing due to old breaks. At the top of the brooch is an integrally cast half round knob that has a domed head, narrow waist and raised transverse collar. It is decorated with pairs of incised transverse groves above and below the waist, with a transverse band of punched concentric semi-circles on the head, and a transverse band of punched circles on the collar. On the back face of the head is an integrally cast single semi-circular pin lug with central circular aperture, missing its pin due to old breaks but with relatively extensive iron corrosion. The entire object has a worn and corroded dark green patina and measures 34.11mm in length, 19.02mm in width, 4.74mm in thickness, and 9.89g in weight. This is an incomplete cruciform brooch of Anglo-Saxon date. The presence of integral half round knobs suggests that it is likely to be of 6th century AD date.